A 300-page tome that outlines everything you ever wanted to know about designing pedestrian signals for folks who are blind or have low vision. This guide clearly describes the many different types of accessible signals (e.g. tonal signals, messages, vibrotactile), explains design considerations, discusses the advantages and disadvantages of each, and (this I find especially helpful) explains how a blind or sight-impaired person would actually use the accessible signal in their everyday travel. After touring the world in search of effective safety measures not found in the US, highway officials came back with a dozen or so promising ideas to test out. 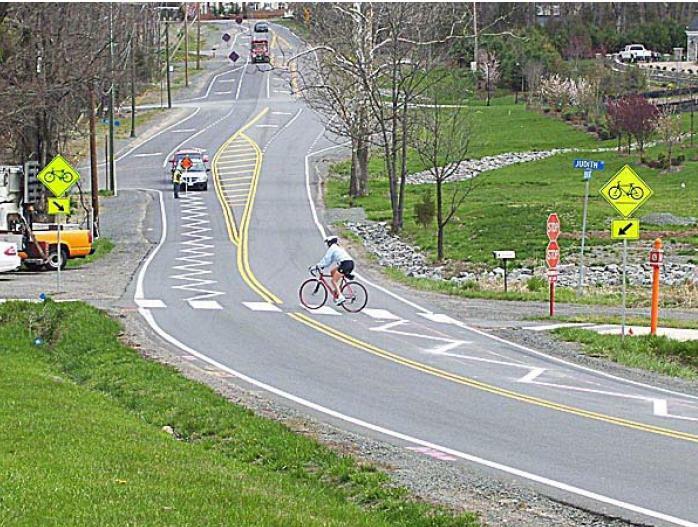 One of these, installing "zig-zag" pavement markings on roadways with significant bicycle and pedestrian traffic, is intended to raise motorist awareness of vulnerable users, reduce roadway speeds, and decrease pedestrian and bicycle crashes. 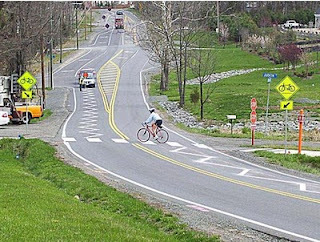 This study tests out the technology at two Virginia locations where the multi-use Washington and Old Dominion trail crosses a major roadway. The study showed that the markings were associated with lower driver speeds and a higher tendencies for drivers to yield to other users, although the unfamiliar markings did cause some confusion among roadway users, who weren't entirely sure of their intent. Using a video survey and questionnaires to evaluate pedestrian and driver behavior before and after the installation of a pedestrian countdown timer, this New Zealand study evaluates the effect of the timers on the number of late finishers, later starters, runners/aborters, violators and pedestrian vehicle conflicts. In contrast to previous studies, this one showed a decrease in pedestrian safety following the installation of timers, perhaps because pedestrians underestimated the time it took to cross the street and because the signal timing was inadequate to allow for a safe, complete crossing. Also out of New Zealand, this study surveyed 4,000 Kiwis about their typical walking and biking habits. While the study showed that many people (about 40 percent) walked or biked for transportation purposes, the majority limited their walking or biking to strictly sport or recreation. While helpful in upping daily physical activity, only a small percentage (about four percent) of Kiwis actually meet recommended weekly activity requirements (30 minutes of vigorous exercise, five days a week) entirely through active transportation.